Right now you can save over $22,600 on our last Winnebago Trend 23D motorhome for sale! With a price of just $73,995, being able to travel comfortably everywhere you go has never been so easy. Before you take another vacation, first check out all of the interior and exterior features of this single slide RV to see how it can make your next trip the best one yet. Save thousands on our last Winnebago Trend 23D Motorhome! The cab of the Winnebago Trend comes with lots of items meant to assist with keeping you and your recreational vehicle safer. A 5” LCD touch screen located in this area will not only come with radio functions such as SiriusXM radio, Bluetooth, a CD player, and USB ports for plugging directly into your smartphone, but it will also have GPS navigation and a rearview color monitor system to keep you on course and give you a perfect view around the RV while parking or backing up. Drive safely and in comfort in the innovative cab. As a single slide couple’s coach, the interior will be a compact design while still housing all of the residential features you could want. This model will have a full kitchen and living room combo complete with comfortable seating, 28” HDTV, and every appliance needed for storing and preparing your meals. At the rear, you’ll find a set of two twin beds with a flex bed system that can convert them to a single bed perfect for two, so you can decide how you need the sleeping spaces to be. 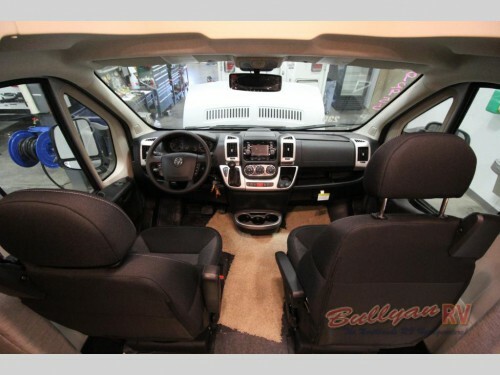 There will even be a full bathroom at the back to provide the privacy and comfort you need on the road. Luxury can be found both inside and out! Although the inside of the Trend 23D Class C is large enough to walk around in, you will probably want to spend some time outdoors while at the campground. Luckily, there are amenities on the exterior of this RV meant to help you do just that. Things like outside speakers and a powered patio awning with LED lighting will help create the perfect sitting space that is not only shaded but will also let you enjoy your favorite radio stations for some outside entertainment. 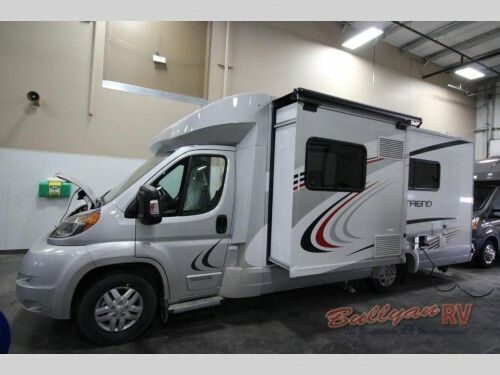 Every area of this Winnebago Trend 23D motorhome comes with luxury features you are sure to love, and with this being our last one available, we are selling it for a heavily discounted price. But since the savings for this RV are so large, it is unlikely to last on our lot for long, so be sure to hurry up and contact us or stop by our location today!